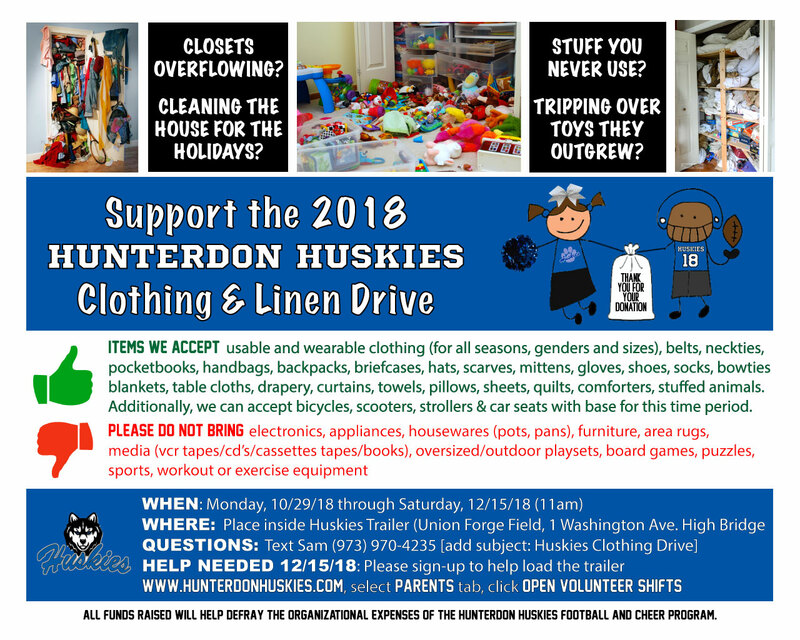 Fundraising is a necessary function for all youth volunteer organizations and the HBAA (High Bridge Athletic Association - Hunterdon Huskies) is no exception. We rely on all families to help in this regard to make the organization the best it can be. General fundraising efforts allow us to keep the registration fee at a reasonable level, allow for the purchase of high-quality, safe equipment, and help cover high general costs. There will be mandatory fundraising during the season and additional fundraising activities may be necessary to achieve our future goals and playoff/competition expenses. -Please write individual checks for individual fundraisers. Do not write one check, combining fundraisers. -Bounced checks will be deducted from end of year fundraising checks. If returned funds are later collected by the member who sold the sponsorship or fundraiser, we will then pay them out accordingly. All cheer participants are to participate in Organizational National Fundraising, regardless of whether or not you choose to Opt-In to or Opt-out the Cheer National Fundraising Program. Participation in the Cheer National Fundraising Program is Optional. If you choose to participate – you will receive a Nationals Reimbursement check (timing is Feb 2019), but you must meet the minimum requirements identified below. If you choose NOT to participate, you will not receive a Nationals Reimbursement check. (A) Cheer – Required - You must do at least one of the following, and meet the minimum requirements - doing both/selling more than minimums increase the amounts of your Reimbursement checks. Individual Fundraising is optional and only available to those participating in the fundraising program (Cheer & Team Sponsor Poster). Checks will be cut after Nationals – distributed at the 2018 Banquet. The 2018 Banquet is in February 2019. This means you are fronting all travel expenses related to Nationals (airfare, hotel, meals, etc) for your cheerleader. Giving Bean (coffee & tea) is an individual fundraisers and only available to those who choose to participate in the Cheer Nationals Fundraising program and therefore fully participating in Cheer & Team Fundraising. If you sell Giving ean – your individual profit will be added to your individual reimbursement check. We track everything. If you sell individual fundraisers and your team does not advance to Nationals – your profits go to Huskies general account. **Any orders missing money after the due date, will not get processed. Please double check your orders along with amount collected before turning forms/payment in on time. Product is shipped directly to your customer - you don't need to touch an order form! The link can be shared on Facebook or in an email blast to sell beyond the state of NJ - the perfect time to ask for support from far away friends and family who can't purchase a pie! SUPPORT YOUR FAVORITE TEAM! All teams selling the same products. To send an email, just include the Huskies link https://www.givingbean.com/store/home.php?partner=f53c1. For Facebook, go to the welcome page link above, click the Facebook icon to send an appeal to friends. Another great way to campaign for support from far away friends and family! Provide your Sponsor Forms and checks (payable to HBAA) to your Team Lead By 11/19! Each athlete who Opts In to the Cheer National Fundraising Program, must secure 3 sponsors (more is better). Returning families who Opted In last year will see their names attached to the same sponsors from last year to solicit again this year. If you are NEW to the Fundraising Program this year -- you will see lots of companies available. You will see there were some who supported our program last year, but who do not have an owner this year. Please review the open names and advise at least 3 companies that you plan to solicit. ALL -- To request an open sponsor, please email me to inquire if it is still available BEFORE soliciting the business. I will reply as quickly as possible, and then once you receive confirmation that it is still available, you can solicit the potential sponsor. Please note that if you do solicit a Sponsor who is "owned" by another athlete -- that athlete will get the credit for the sponsorship. If you have a potential Sponsor that you would like to add that is not on the list, please email me, and I will add to the list. If you are assigned a business that you do NOT plan to solicit, please let me know that as well, so that someone else can pick up the name. A letter that you can provide to potential sponsors (attached both Word file and PDF); Also feel free to have your athlete write his/her own letter as well, if desired! Please have the Sponsor complete the form and return with payment -- be sure spelling is correct, and handwriting is neat! Some Sponsors may say that they do not donate monetary items, but they will provide an item for a Tricky Tray. In these cases, please do accept those items, and turn them in to your Team Leads as well. We will use them at our banquet in February! You will still need at least 3 Sponsors who contribute to the poster however. Upon receipt of all sponsor order forms and checks (by 11/19) -- we will design our Team Sponsor Posters, 1 for each qualifying National team. It takes us a little while to design and set the posters perfectly, so that they are ready to go before teams leave for Nationals (they are printed immediately after Nationals). If at Big East Regions, any of our teams do not qualify for Nationals -- we will reach out to those teams' opt-in families, to see if those sponsors would like to sponsor a different team, or not. After Nationals, we will use a Nationals photo and print the Sponsor Poster. You will be given 1 Sponsor poster for each Sponsor you secured, along with a draft of a Thank You Letter. You are to give one to each of your Sponsors as a Thank You! Please ensure that you do not sign up for a date/time slot that conflicts with cheer practice or competitions. There are signup slots for “athletes” and “parent/guardians’ for each location, by shift. When you login to your Hunterdon Huskies account you can use your login to select an athlete and/or parent/guardian volunteer shift and it will credit your family account. There's a 2:1 ratio for supervision children for each time slot. If you want to stay and the parent slots are filled, feel free to stay. If you want to can with another family, please reach out and discuss offline, there is no option to see who signs up online for privacy purposes. Please decorate and bring a can for each athlete. Be creative with Huskies name/logo boldly displayed. Please bring a ziploc type bag and permanent marker - each canning shift should place their collections in ziploc bags and write the location, time slot and names of the athlete who canned on the bag. The bags will be collected periodically, minimally at the end of the last shift. There is no need to count the money - it is not safe to do so. We will track and make visible how much was collected. For each location, the 1st shift should let a manager/customer service know that we have arrived, and last shift should let them know we are leaving and thank them. Note that cheerleaders should be in full uniform, with Huskies jacket, gloves, hat, pants, etc as needed, when they are canning. Football players should wear their jersey. At least 2 athletes and 1 adult should be at each entrance & exit. Please do not leave athletes unattended; at least 1 adult should be with them at all times. The sign-ups are designed with a minimum 2:1 ratio of athlete to adults. Remember safety first - do not wander around the parking lot and stay back from the curbs. While canning, SMILE and POLITELY ask for a donation to support for the Huskies journey to Nationals in Florida. Thank everyone, wish them a nice day, even if they do not donate. If you have any questions at all or need to change your shift please text Kim at 201-320-3194 or email hunterdonhuskies@outlook.com. **If for any reason you cannot cover your shift last minute, please reach out to a member of your cheer or football team to cover so we have full support on the shift. Thank you for your effort and participation! If you have any problems siging up please email hunterdonhuskies@outlook.com or text 201-320-3194 for assistance. Strong support of our Clothing Drive (recommended that you collect 10+ donated bags from any source – friends, neighbors, yourself; and that you share this flyer on social media.